The paper that the letter is written on must be white lined paper, free of stains, spills or discolorations. Envelopes must be pure white only. Drawings must also be in either non-colored pencil or black ink. With the exception of stamps (that will be removed by Mail Room staff), envelopes must be free from all stickers, address labels, tape or other adhesives. The address and return address must be written or typed directly on the envelope. Drawings must be in blue or black ink or non-colored pencil. Greeting cards and photos must not be multi-layered or laminated. Incoming mail must be odorless with no scent or aroma. Mail received that does not conform to this policy will be returned to sender or sent to Special Services, even if a money order is enclosed. Inmates can use funds to purchase canteen items (candy, sneakers, toiletries, etc). Pre-Trial Inmates can also use funds to post bail. Visitors can deposit funds through the kiosk located in the modular complex lobby. The kiosk accepts cash, debit, and credit cards from 7:00 am – 10:00 pm, Sunday through Saturday. United States Postal Service money orders (payable to the inmate) may be mailed to the facility (cash will not be accepted). Deposits can be made with a credit or debit card by calling (866) 345-1884. In order to receive phone calls from an inmate you must set up an account with Securus. This can be done by phone at (800)844-6591 or online at www.securustech.net. You must be on an inmate’s phone list in order for them to call you. 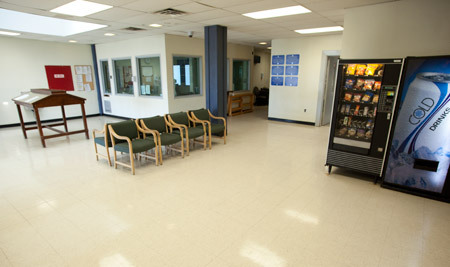 Inmate Property can be picked up in the Main Jail building between the hours of 8 AM and 4 PM (Mon-Fri). A release form is required if an inmate is unable to collect his property himself. Checks for remaining inmate funds can be picked up in the MODS Administrative Building between the hours of 9:30 AM and 3:00 PM (Mon-Fri). Clothes for court can be dropped off at the appropriate Control Booth during the hours of 10:00 AM and 2:00 PM (Mon-Fri). Clothing exchanges conducted Monday – Friday (no weekends or holidays) only between the operating hours of 10:00 am to 2:00 pm. Clothing Exchange Authorization must be completed prior to transaction. Minimum of 24 hour notice required. Authorized person must be currently on the inmate’s visitor list.